Amy Gulick takes a look at two of Italy's most important feast days of spring – St George's Day (23 April) and St Mark's Day (25 April). Saint George, the third century Roman soldier who in the Middle Ages gained a legendary reputation as a dragon slayer, is the patron saint of numerous Italian cities and villages. In Siena, for instance, where liberator and protector San Giorgio is patron of the Sienese militia, jousting tournaments and mock battles were once held in his honour, a tradition dating to Siena’s victory in the historic Battle of Montaperti of 1260. In Ferrara, Emilia-Romagna, where St George’s cult status derives from a medieval folk belief that a dragon inhabited the Po River, locals honour him with the famous Palio horse race, and in so doing invoke the saint’s protection from the dangers of the Po and other nearby waterways (namely floods). 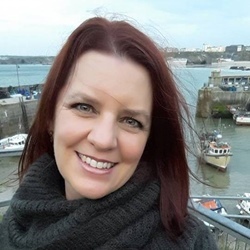 As with many feast days, some of the culinary customs associated with St George speak to the availability of certain foods or ingredients come the feast day itself, as well as a connection to the seasonal, cyclical practices of a pastoral society. The Lombard specialty pan di meino represents one such custom. Once a simple millet flour bread, pan di meino (or pan de mej; both names are dialect versions of the Italian pane di miglio, meaning millet bread) is typically made on St George’s day. By an ancient agrarian tradition, 23 April was the day contracts between herdsmen and milk vendors were drawn up for the coming year, and thus was a time associated with an air of abundance and economic security. On this day, partaking of pan di meino flavoured with sambuco or elderberry flowers—ready for harvesting, coincidentally, on or near 23 April—formalised the farmers’ transactions. Herdsmen would then offer a cup of fresh cream to accompany the pan di meino, a tradition that lives on in the practice of serving cream with ‘St George’s Bread’, today a sweet, cookie-like pastry. 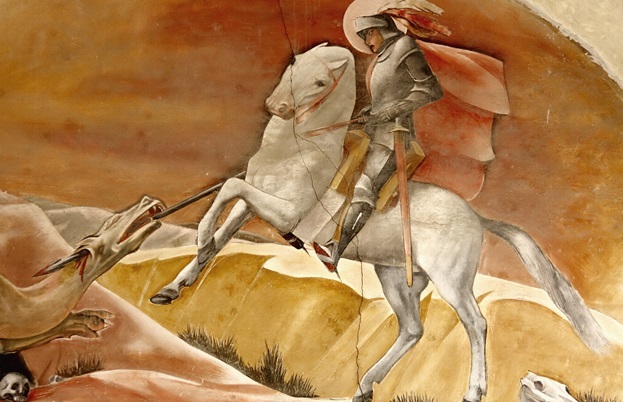 St George is also remembered on Italian tables thanks to a mushroom named after him. Il fungo di San Giorgio is said to first appear on 23 April, though naturally factors like location and varying weather conditions mean this mushroom (also known as il prugnolo), can be found before or after the feast day. Yet they are an undoubtedly early mushroom, one of the first to be gathered in spring, as attested to by the Tuscan saying al primo tuono nasce il prugnolo, (‘with the first rain, the prugnolo is born’). Prugnoli are used in soups and frittatas, and they make for lovely pasta dishes such as tagliatelle al sugo di prugnolo, a simple yet very savoury sauce of the mushrooms cooked in butter or olive oil, parsley or rosemary, garlic, shallots and a small amount of dry white wine. 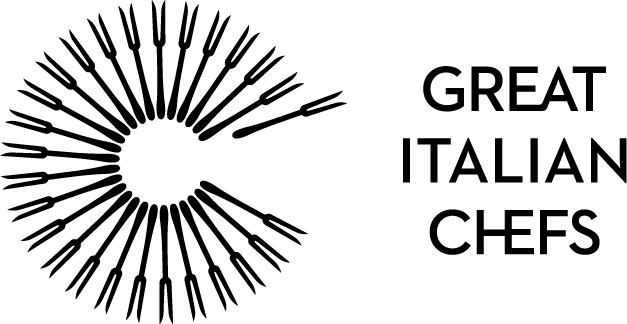 In April, as the season of the Italian sagra (food festival) picks up, St George’s mushroom will dominate many local culinary scenes. 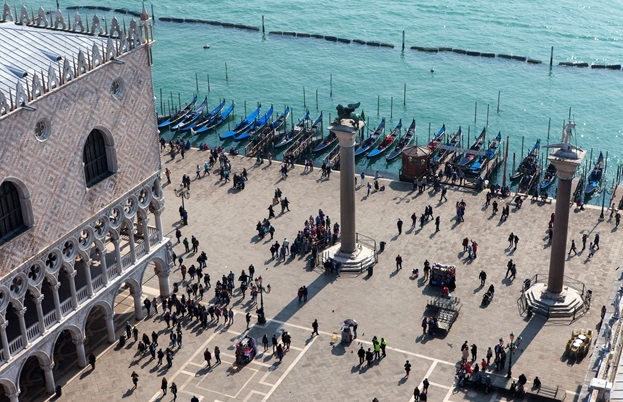 On 25 April Italians honour another important saint – San Marco. 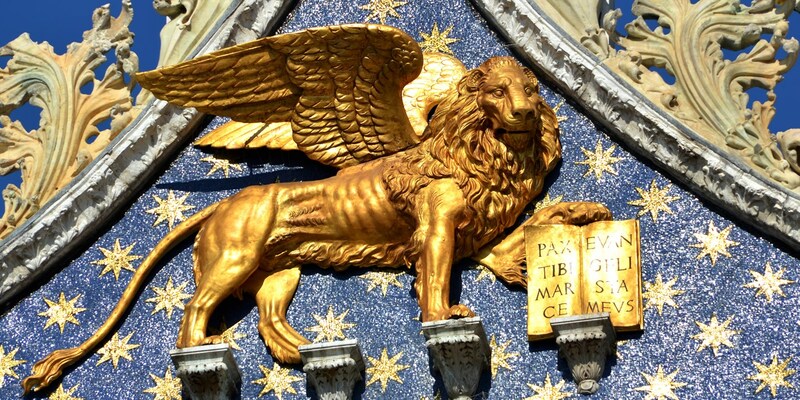 To Venetians in particular, Mark the Evangelist holds special significance as patron of the city, for whom the principal square is named and the basilica that holds his relics dedicated. According to a centuries-old tradition, Venetians observe St Mark’s Day with the (almost compulsory) eating of a dish called risi e bisi, or ‘rice and peas’ in Venetian. There are all sorts of stories about this dish. In the Republic period, come St Mark’s Day risi e bisi was invariably served to the Doge. It’s also said that a true dish of risi e bisi must contain more peas than rice, or at least equal amounts of peas and rice grains. Anecdotes aside, this famously Venetian dish, often described as half risotto, half soup, is arguably connected more to Mark’s symbolic role in Venetian civic history than to Catholic observance. Its continued prominence reflects both the importance of rice production in the Veneto region and the ready supply of fresh peas in April, the latter thanks to the noted agricultural production of Venice’s smaller islands such as Sant’Erasmo, Vignole, and Torcello. In times past, these islands functioned like fresh produce suppliers to the Venetian populace. On the other side of the Italian peninsula, in the Nuoro area of Sardinia, the people of the small town Lei venerate St Mark with a religious procession to the rural country churches dedicated to him. Among the procession participants are local women carrying trays and baskets of small votive breads, pale in colour and intricately decorated with flowers, garlands, birds, leaves and more. These elaborate dainty breads, called cocoietas in the local dialect, are later blessed and dedicated to St Mark, who is considered protector of the fields.